How many grandchildren? What are their ages? Eight: one is 9, one is 7, two are 5, one is 4, two are 1 and one is almost 2 months old. Any great grandchildren? Ages? No, hopefully we have a while before that time. How often do you get to see your grandchildren? At least once a year. However the 4 that went to Korea a year ago Christmas Eve, it might be 2 years before we see them. But Nalyssa was just here for 2 weeks, she is the 1 year old, she came home with her mommy to visit her Grandpa when he got sick. What is the best thing about being a grandma? Getting to hear about all the things they get to do in the other countries and states they live in. Their plays and programs. What is the most challenging part of being a grandma? Having to live in Colorado Springs and they are in Korea, Japan and Kentucky. 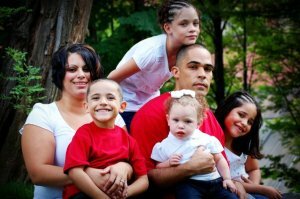 My oldest son Demitrius, his wife Jennifer and their 4 children, Nariah, Nalayah, Awntario and Nalyssa. Describe a recent time one or more of your grandchildren made you laugh out loud. The summer of 2008 my husband was sitting in a plastic lawn chair on the front porch getting his fishing poles ready to go fishing the next morning. Awntario, one of the 5 year old boys, saw the back of the chair bending back and he yelled out "Grandpa, you better get out of that chair before you break it". Everybody started laughing, he didn't understand what he said was funny, he was a little embarassed and thought we were laughing at him not because of him. What is your favorite thing to do when your grandchildren visit your house? I have to do a big BBQ!!! 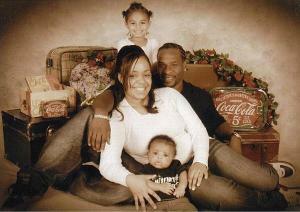 My daughter, Shakia, her husband Khalil and their children Xaria and Nasir. ( I don't have pictures of my stepson's 2 children, but their names are Treshaun and Addison. )What is your favorite thing to do when visiting their house? Again a big BBQ!!! Make crafty things and bake. 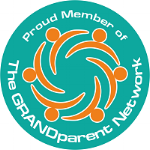 What do you most want to pass along to your grandchildren? My love for Jesus and thankfulness for all He has done. What is one word you hope your grandkids think of when they think of you? Laughter!!!! That was hard to come up with one word. But I think all the ones I thought of bring laughter.